The NBA announced the 2017 Christmas Day slate on Thursday. Which games should you be excited for? The NBA released its Christmas Day schedule for the 2017–18 season Thursday, revealing which teams will square off on the regular season’s marquee day. 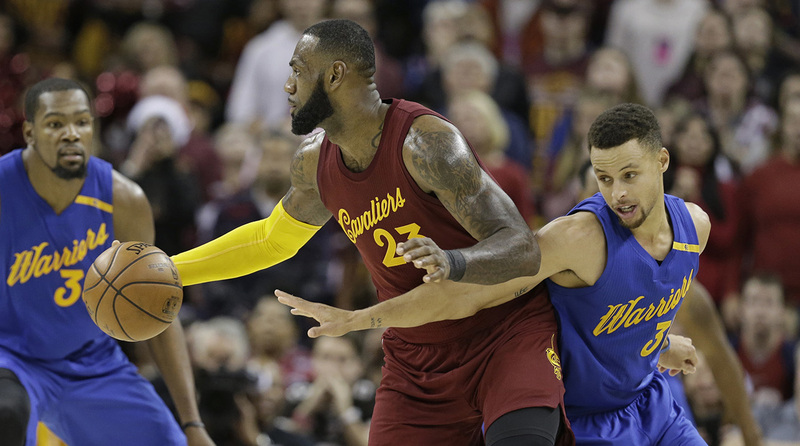 The usual suspects—LeBron James, Stephen Curry, the Lakers—will be involved. The league also took advantage of the summer’s flurry of superstar movement, scheduling games that will include Chris Paul, Paul George and Jimmy Butler on their new teams. Let’s see how each matchup grades out. This game has the potential to be a spectacular undercard, thanks in large part to the mouth-watering thought of Joel Embiid and Kristaps Porzingis lining up against each other. There are a few issues holding this one back from being a true Christmas classic, however. The Knicks aren’t going to be very good, and the 76ers are a completely unknown quantity thanks to their young (and frankly, injury-prone) lineup. If all are healthy, it may not be a game between two juggernauts, but watching two of the league’s youngest, most fun stars going head-to-head to tip off Christmas will be well worth planting yourself in front of the TV for. Look, the NBA has to schedule this game for the prime slot on its biggest day purely for the ratings if nothing else. But there’s a little fatigue surrounding the regular season matchups between these two teams, especially considering these games are always overshadowed by the inevitable Finals matchup. Cleveland won at home on Christmas against Golden State last year; it meant nothing come late June. The Warriors destroyed the Cavs in a regular season game two seasons ago (remember Steph stealing the ball from LeBron? ), and Cleveland responded with the greatest comeback in Finals history. Also looming over this game: Kyrie Irving. Will Irving, one of the central figures in this rivalry, even be playing for Cleveland by this game? If he’s not, it certainly takes away from the intrigue. We still get to see the three best basketball players in the world (LeBron, Curry and Kevin Durant) on the court at the same time, so there are plenty of reasons to tune in. Throw in the volatility of LeBron’s frenemy Draymond Green, there’s definitely potential for some fireworks. I love this matchup. The Celtics and Wizards took their rivalry to comical heights last season, with funeral games mixed in with hard screens and some extremely flagrant fouls. Their seven-game playoff series was the best of the most recent postseason. These teams have a healthy dislike for one another, and it translates on the court. Both the Wiz and the C’s are lurking as usurpers for the throne in the East, and they would love nothing more than to tear down each other along their fight to the top. Plenty of stars will be involved as well—John Wall, Brad Beal, Isaiah Thomas and Boston newcomer Gordon Hayward to name a few. Expect both of these teams to try to make a statement on Christmas Day. This is the best matchup of the day. If you’re celebrating Christmas, make sure your relatives have left the house and the kids are too tired to bother you during this one. The Rockets and Thunder will both be vying for the second spot in the West next year, and both loaded up in the offseason to prepare for the Warriors. These teams will likely have to go through each other for a spot in the conference finals, so don’t be surprised if this is a playoff preview. Chris Paul vs. Russell Westbrook. James Harden vs. Paul George. This game is going to be fast, fun, and filled with offense. This is the platonic ideal of a Christmas Day game: A star-studded matchup with positional rivalries featuring two equally matched teams who fashion themselves as contenders. This game can’t come soon enough. How Will the Thunder Deploy Russell Westbrook and Paul George? You can forgive yourself if you fall asleep during this one. The Lakers are a shoo-in for Christmas Day games because of their status as a TV draw, but they still aren’t worth it from an on-court standpoint. I fully believe Lonzo Ball will become a star, but the rest of L.A.‘s roster is still lacking in excitement. The Spurs would have been a good pick here, particularly to watch the Butler vs. Kawhi Leonard matchup. The Pelicans could have also been interesting, with Kentucky stars Karl-Anthony Towns, Anthony Davis and DeMarcus Cousins all sharing the same court. This game will be far from unwatchable, however. Lonzo is capable of providing theatrics, and the Wolves should be much improved after their big off-season. Towns and Butler alone are worth the price of admission, and it’s possible the Lakers’ youngsters have gelled into something more cohesive by Christmas. This one could lack competitiveness, but you never know. After all, there’s a reason why they play the games.